That created all kinds of problems. First is the issue of fungal disease. Virginia is a difficult venue for growing wine grapes in the best of circumstances. Unlike, say, eastern Washington state or the California wine valleys, our weather tends to be humid with regular rainfall. The only way to keep diseases such as Botrytis or Downey Mildew at bay is to spray regularly. That means within a day after a rainfall. And for a weekend vintner like myself, that isn’t always possible. Our sprays were fairly simple: Mancozeb, and if it wasn’t too hot, sulphur. Mancozeb is effective for lots of things, but it has a long PHI, or preharvest interval. That means that the last Mancozeb spray has to go on some 60 days before the grapes can be harvested. That was okay, because we had made a decision early on not to harvest this year. Our vines are in their second year, and many of the folks we came into contact with through our viticulture classes said that the first two years should be devoted to developing a good root system and a strong trunk. Since then, I’ve talked with lots of people in the business who have gotten a small harvest in the second year. 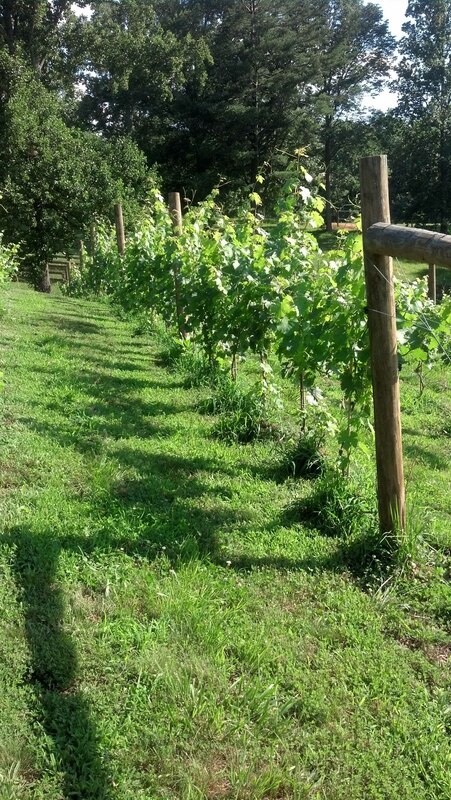 However, our vines didn’t make much progress in the first year, so it seemed prudent to let them have this growing season to develop roots and trunks. 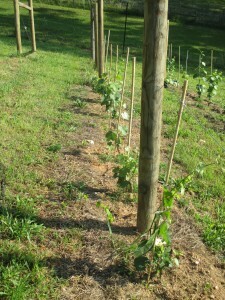 I remember feeling a bit discouraged last year at the slow progress our vines were making. Many failed to reach the cordon wire, although in fairness our cordon wire is a bit high at 40 inches. Still I told myself that we should have faith in the root system that was surely developing out of eyesight, and in fact that proved to be true. The Merlot in May, getting ready for a big growth spurt in June and July. 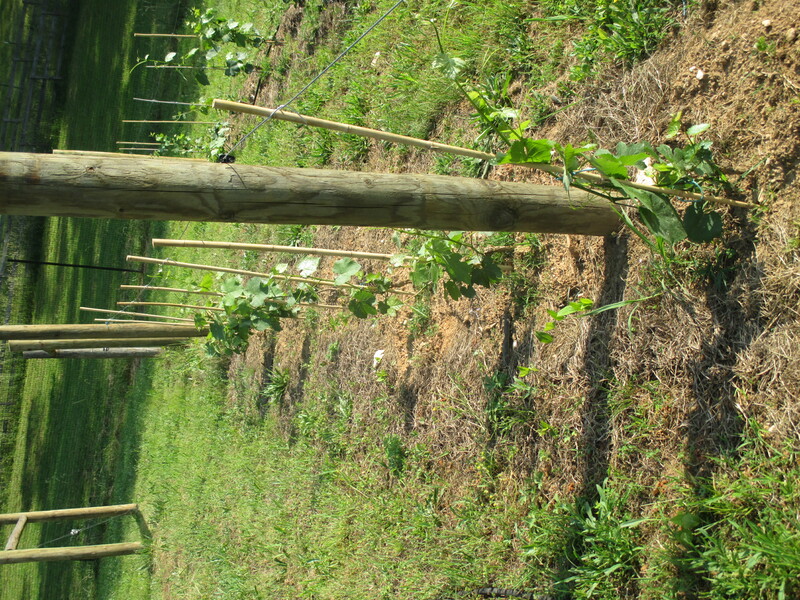 My wife, the Vineyard Goddess, suggested pruning back to two buds in the Spring, and we did. Well, actually, she did. I came close, but I couldn’t bear to prune away so much of the vine, so I left a bit more of the trunk behind. I suspect that the VG came along behind me and fixed things, but in any event, the growth this year was nothing short of amazing. They reached the cordon wire quickly, and by the end of the season were up close to or at the top of the trellis. Of course, some of that growth was undoubtedly hastened by the rain. The Merlot we planted this year provided an interesting contrast. Those vines hit the cordon wire early in the summer, and grew up from there. 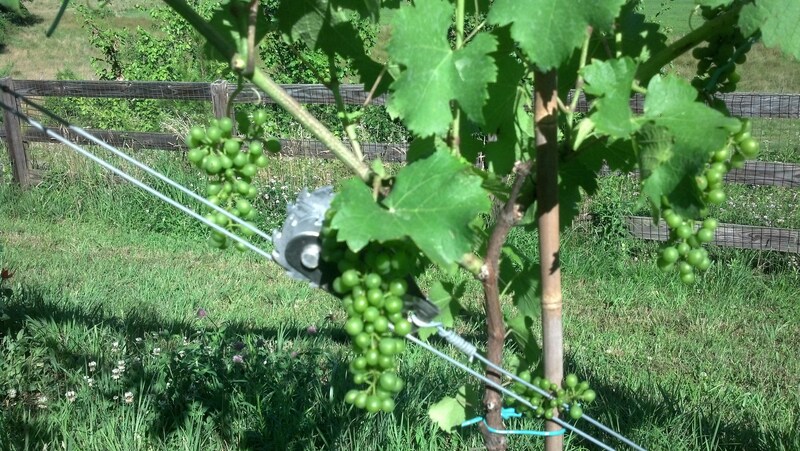 I’m sure some of the extra growth was a result of the heavier rainfall, but some undoubtedly was the result of the rootstock we chose for these vines. All of the vines we planted the previous year were grown on a rootstock known as 101-14, which is supposed to be good for the clay soils we have. It also features moderate vigor. The Merlot was planted on 3309, which results in a more vigorous vine. It would have been nice to have had some of the Merlot on 101-14 to be able to contrast the two rootstocks, but when you’re purchasing vines in multiples of 25 (that’s 25, not 25 hundred or 25 thousand), you tend to go with one clone and one rootstock. 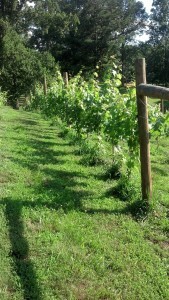 We purchased 50 Merlot vines, all clone 181 on 3309. 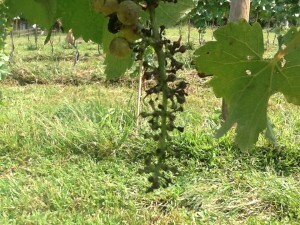 We approached harvest time with only a small amount of fruit on the vines. As I said, none of it was usable for wine given our choice of spray, but we were interested in knowing how well the grapes were ripening. One weekend in September, I tasted the juice from a cluster of Petit Verdot and another cluster of Cab Franc, and was thrilled with the sweetness. As it happened, the small amount of testing equipment I owned was at our other property, and I made a mental note to bring it with me next weekend. I did bring it the following weekend, but I was confronted with yet another lesson in vineyard challenges: The vines had been picked clean. I assumed that birds were the culprit, but it could just as easily have been deer or bears or racoons or maybe squirrels. A few weeks later, we found that part of our deer fence had been torn apart at the top. Our neighbors informed us that they had seen bears prowling around in recent weeks, and the tear had all of the earmarks of a very large animal. In any event, two of the lessons that stand out from this year involve the absolute necessity of a good deer fence and bird netting. We weren’t alone in any of these problems. If you take a look at the regional reports in the fall issue of Grape Press, the quarterly publication of the Virginia Vineyards Association, you’ll see that everyone dealt with the same challenges. Other vineyard managers said that the damage from predators had stolen a significant fraction of their crop this year. That’s heartbreaking. But there’s more. 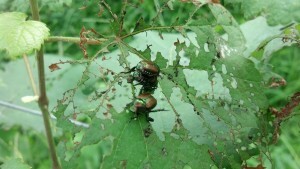 Grape vines are subject to so many diseases that I sometimes wonder why anyone would get into this business. And as we approached the end of the year, we took a class with Lucie Morton, who has just been named one of the twenty most admired people in the North American wine industry by Vineyards and Winery Management magazine. Lucie is deeply concerned these days about a new grape vine disease, Red Blotch. This is a new one, and we only know so much about it. But the biggest concern is that vineyard nurseries can’t guarantee that their “certified” stock is free from Red Blotch. Lucie recommends waiting at least another year to order new vines. But those of us who planted over the past two years can only hope for the best. We’ll be taking samples and sending them off to a (very expensive) test lab to see if they are free from Red Blotch. And while we’re at it, we’ll test for Leaf Roll 1, 2 and 3, plus Pierce’s Disease. We’ll be heartbroken if they’re infected, but better to know now then to nurse infected vines along for another year. Well, my grandfather, who farmed 1,000 acres or so of corn, wheat, soy and other crops in Iowa, dealt each year with the vagaries of weather, prices, and disease, not to mention the Great Depression, which put many of his neighbors out of business. He knew that farming was a challenge in the best of times, but he always kept faith that next year’s crop would be better than the one before it. And we are optimistic as well – no matter what, we think that next year is ours – the year our vines will be ready to produce a crop of grapes that we’ll turn into some really fantastic wine. Get ready to raise your glass. « Where Did the Grapes Go?